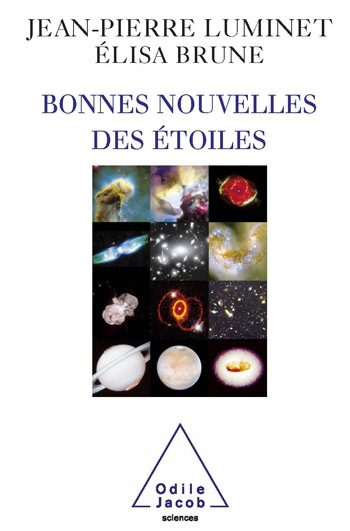 Jean-Pierre Luminet, an astrophysicist and an internationally recognised specialist on black holes, is a research director at the Centre National de la Recherche Scientifique (CNRS) and a member of the Universes and Theories Laboratory at the Paris-Meudon Observatory. He is the author of Le Destin de l’Univers (2006), De l’infini (2005), L’Univers chiffonné (2005), L’Invention du Big-Bang (2004), Le Feu du ciel (2002) and Le Grand Atlas de l’astronomie (1994). Elisa Brune is a Belgian novelist and science journalist. She is the author of Séismes et volcans (2007) and Le Quark, le neurone et le psychanalyste (2006). “This book describes the current state of knowledge on astronomy, without taking the form of a science lesson. The goal is not to master arcane information on gravitation and high-energy physics but to wander freely through cosmic landscapes that have become increasingly precise and diversified over recent decades. More knowledge on astronomy has been amassed in the past thirty years than during the preceding three millennia. “The promenade we invite you to take covers recent discoveries and is divided into three parts, qualified as regional, national and international. What do we now know about the solar system? About our galaxy? About the Universe as a whole?” write J.P. Luminet and E. Brune. This enthralling work of popular science by a world-renowned expert provides the bases of astronomy as well as information on the latest discoveries and hypotheses. It covers such subjects as exoplanets, life in space, the structure of the Universe — which are all presented here with the scientist’s enthusiasm and the storyteller’s brilliance.